Just one day after UN training and research agency UNITAR had confirmed via satellite images that Palmyra's Baalshamin Temple was destroyed by Islamic State militants, ARCA has received word from multiple direct and indirect sources that The Temple of Bel has also been targeted. The temple is aligned along the eastern end of the Great Colonnade at Palmyra and its epigraphic remains attest to the temple's dedication in 32 C.E. After that, it underwent changes through the course of both the first and second centuries. Since the spread of Islam in the 7th century the Temple of Bel has been used as a mosque though the 1920s. The Temple of Bel's cella are unique. 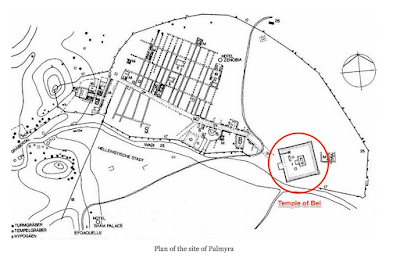 Two inner sanctuaries, the north and south adytons ((a restricted area within the cella of a Greek or Roman temple) are dedicated as the shrines of Bel and other local deities. Both the North and the South chambers had monolithic ceilings. The Northern chamber’s ceiling highlighted seven planets surrounded by twelve zodiac carvings as well as a camel procession, a veiled women, and what is believed to be Makkabel, the god of fertility. While many believed the temple's repurposing as a mosque would have offered it protection, this imagery may have been the target for destruction under Daesh idiology. 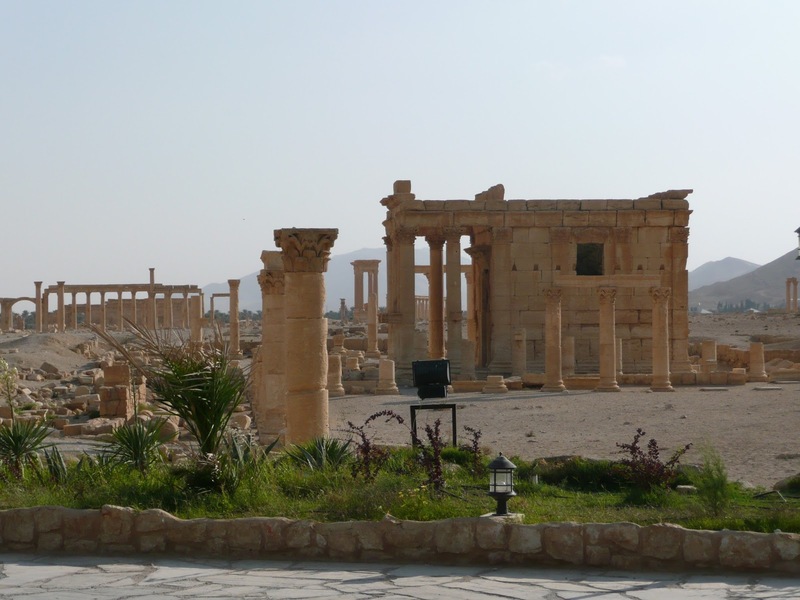 The Islamic State took control of the historic site of Ancient Palmyra on the May 21, 2015. The extent of the damage to the Roman-era structure is still being investigated. Due to the number of conflicting reports, ARCA has been continually aggregating reports on the status of the Temple of Bel as more conclusive information came in and could be corroborated. 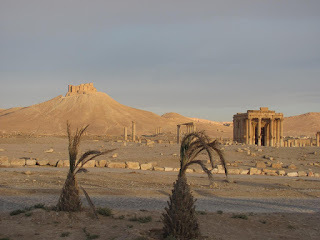 Update September 01, 2015 07:30 GMT+1 At 7:30 this morning, ARCA posted word that the UN Training and Research Agency (UNITAR) had confirmed that satellite images received have confirmed that the Temple of Bel, in the ancient city of Palmyra in northern Syria has been destroyed. Tom Holland, and London-based writer and historian gave this sad, but fitting eulogy, which we have included in the satellite photo caption below. dedicated when Tiberius was emperor and Jesus was alive. UN Training and Research Agency (UNITAR) posted news of their satellite and image analysis shortly after midnight. Their written statement reads "We can confirm destruction of the main building of the Temple of Bel as well as a row of columns in its immediate vicinity." 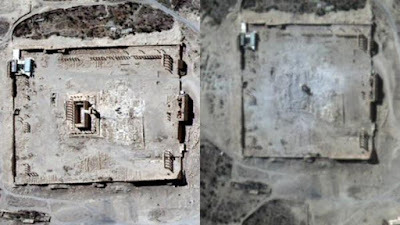 Einar Bjorgo, manager of UNITAR’s Operational Satellite Applications Programme - (UNOSAT) said a satellite image taken Monday "unfortunately shows the destruction of the temple's main building as well as a row of columns in its immediate vicinity." 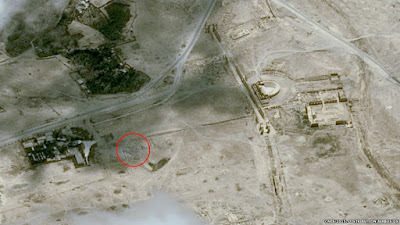 Image Credit/Image analysis: UNITAR-UNOSAT Copyright Airbus Defense and Space - Findings , based on two images: one taken on Aug. 27 which showed the main building and columns still intact and one post destruction. Update August 31, 2015 15:10 GMT+1 Speaking to the Associated Press via Skype today, an Islamic State operative has said that the temple (of Bel) had been destroyed, without elaborating. The individual spoke on condition of anonymity because members of the group are not allowed to speak to journalists. Update August 31, 2015 15:10 GMT+1 Director-General of Syria’s Antiquities and Museums (DGAM) issues a formal statement on their website which reads, in part, "DGAM could not verify this news with confident resources, so the act is not sure nor the size of destruction, hoping it is not true." Update August 31, 2015 14:30 GMT+1 New York Times article, quoting Syria's Director-General of Antiquities and Museums (DGAM), Maumoon Abdul-Karim, seems to indicate the two inner sanctuaries, the north and south adytons, were the target in this attack on Palmyra's immovable heritage. Update August 31, 2015 13:36 GMT+1 Speaking to the Associated Press via Skype today, an Islamic State operative has said that the temple (of Bel) had been destroyed, without elaborating. The individual spoke on condition of anonymity because members of the group are not allowed to speak to journalists. "Rumours about these ruins are always coming out so we have to be careful about news like this." Update August 31, 2015 03:38 GMT+1 Report via the Washington Post states that a contact in Hom’s outside Islamic State territory, using the pseudonym, Khaled al-Homsi, collaborates reports that the Temple of Bel was blown up Sunday afternoon. Update August 31, 2015 00:36 GMT+1 An Al Jazeera reporter in the Syrian city of Homs was told that ISIL on Sunday detonated more than 30 tonnes of explosives. Note: 30 tones would be a significant amount of explosives. If this is correct, the size and sound of the explosion would likely have resembled something similar to what is seen in this video. Update August 30, 2015 23:15 GMT+1 AP and CBS and news reported that a resident, possibly from Tadmor and going by the name "Nasser al-Thaer" reported that a substantial blast went off at 1:45 pm Sunday afternoon. This contact also reported "it is total destruction" and that "the bricks and the columns are on the ground." This witness may be the same person who spoke with AP reporters who confirmed the destruction of Palmyra's Baalshamin Temple Destruction and who previously reported to Syria Deeply on July 21, 2015 that bombs had been planted in the historic temples of Bel and Baal Shamin. 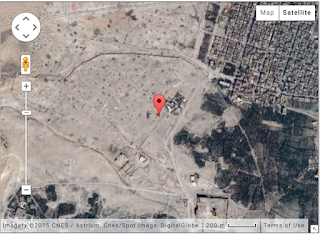 Update August 30, 2015 22:10 GMT +1 The Syrian Observatory for Human Rights has also received word that the temple was targeted but has no further information on the extent of the damage. News sources reported earlier this week via Maamoun Abdul Karim, of Syria's DGAM that the Islamic State militants recently destroyed the Temple of Baal Shamin (Arabic - تدمر – معبد بعلشمين ) . 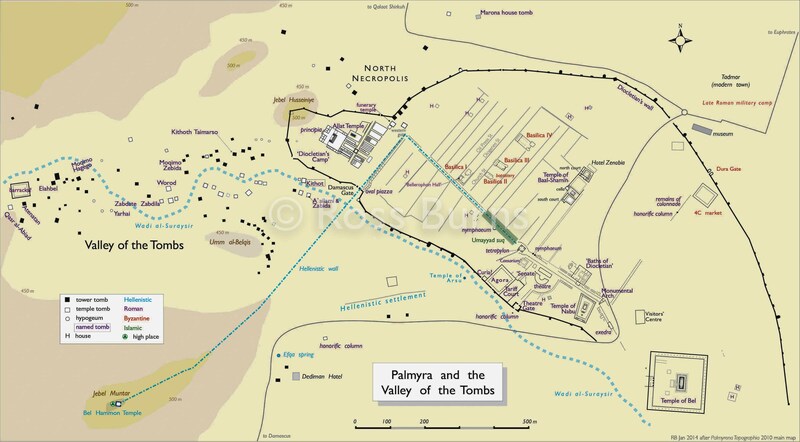 located in the 2,000-year-old Roman-era city of Palmyra and to the north of the city's acropolis. Further news from the AP today reported that the bombing likely took place Sunday, August 23, 2015 shortly after 4pm. I went to see it, not from very close because IS (militants) were there and because I was worried for myself and afraid they will ask me what are you doing here. So I saw it from a distance. A 25-year-old activist, also going by the name Nasser al-Thaer, had previous spoken with the organization Syria Deeply reporting on conditions inside Tadmur, the modern city situated about 500 metres (1⁄3 mi) northeast of the ancient historical site of Palmyra. An Islamic State operative, who spoke on the condition of anonymity with journalists from the AP, confirmed that the organisation would be issuing its own statement soon. The United Nations Scien­tific and Cultural body (UNESCOn) has stated that the temple's destruction was “an immense loss for the Syrian people and for humanity”. The head of UNESCO, Irina Bokova has also called the heinous act a “war crime”. At the time of this reporting, five photos of the destruction of the temple have recently been released by by Islamic militants and distributed on social media. The images show explosives set at the historic site, a mushroom cloud image freeze-framing the explosion and the resulting rubble. Out of respect for the people of Syria, the residents of Tadmur and those that have lost their lives in the protection of Syria's cultural heritage, ARCA will not be publishing ISIL, ISIS, Islamic State, Daesh, Daish heritage "snuff" videos of the temple's destruction. Maamoun Abdul Karim, of Syria's DGAM says Islamic State militants have destroyed the Temple of Baal Shamin (Arabic - تدمر – معبد بعلشمين ) located in the 2,000-year-old Roman-era city of Palmyra and to the north of the city's acropolis. The temple was located 500 metres from Palmyra’s amphitheatre, where Islamic State militants killed 20 Syrian soldiers shortly after overtaking the historical site and the modern city of Tadmor in May 2015. Portions of the temple complex dated to 17 CE though it went through numerous phases of construction in subsequent centuries. Based on inscriptions, the inner temple, or cella was thought to have been dated to 131 CE, immediately after the Roman Emperor Hadrian’s visit to the city one year earlier. Activists reporting from the occupied zone have said that militants used explosives to blow up the Baalshamin Temple. The blast is also believed to have been powerful enough to have also damaged some of the Roman columns surrounding the temple site. The Syrian Observatory for Human Rights, which relies on a network of sources on the ground, said explosives were laid at the site of the Roman ruins at the town, in late June 2015. The exact date of the temple's destruction remains unclear. 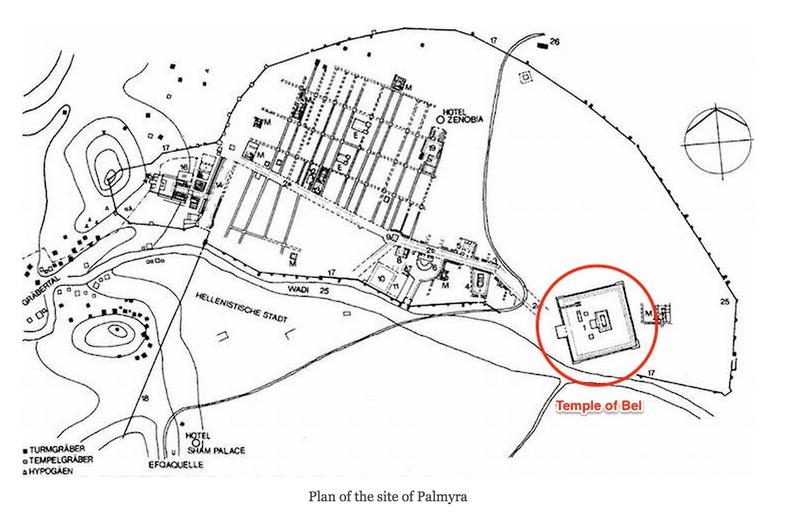 The Temple of Baal Shamin was one of two major temples located at with the confines of the Palmyra archaeological site (along with other lessor temples). No news yet on the status of the Temple of Bel, located at the far end of Palmyra's Grand Colonnade in the southeastern end of the city. This second temple is thought to have been converted in the 5th century CE into a church and in the 12th century into a citadel by the arabs.